With its earthy, interesting, peppery smell, Tea Tree Essential Oil possesses strong antibacterial properties which is great for energizing mind and body and treating respiratory concerns, when inhaled from a vaporizer. It can be blended well with Ancient Living Citronella and Eucalyptus oils to create an effective natural insect repellent. Skin Benefits: Tea tree oil acts an astonishing weapon to get rid of acne and blemish concerns. We recommend you to dilute with Ancient Living Rose Water for better results. Alternatively, there are other carrier oils Sesame, Jojoba or Almond. Hair benefits: Deserve the wonderful benefits of Tea tree essential oil in removing dandruff and cleansing scalp thus preventing hair fall. 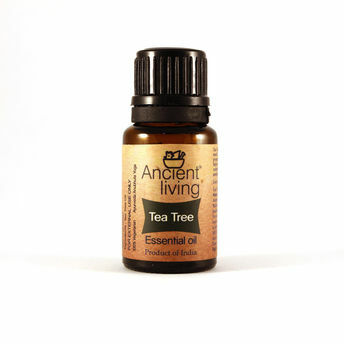 Add two drops of tea tree essential oil along with 10 ml Ancient Living Brahmi and Amla Hair Oil. Gently massage your hair with the resultant mixture. Additional Information: Drawing inspiration from Mother Nature, Srinivasa Industrial & Agro Products (P) Ltd under the brand name 'Ancient Living' manufactures pure natural health care, hair care and skin care products based on Aromatherapy and Ayurveda.An energetic and fresh-thinking brand eager to inspire a naturally healthier way of living through their natural products, Ancient Living brings you ancient wisdom in its Organic Personal care products, Native games, Artisan products and Weaves.With the authenticity of Ayurveda and Aromatherapy wisdom at the brand's core, they care deeply about the wellbeing of all their customers, connecting conscience in everything they do.